We offer Wenatchee River rafting trips from spring until late summer and conditions differ between the early time period and the latter. Early in the season white water rafting on the Wenatchee river occurs during the spring melt-off of the snow-pack in the Cascade mountains which produces high water volumes in the rivers and for the Wenatchee is the time of the season for the Class 3 and 4 rapids and the biggest waves and longest “wave-trains”. Mother nature is unpredictable so the exact dates of the peak water flows are not known until we are in the thick of it, but generally we experience high water from early May until early July. Definitely your best choice for an exciting introduction to whitewater rafting. A trip for the beginner or experienced rafter who wants to experience the thrill of rapids. The Wenatchee River perks from Tumwater Canyon and spills into the Columbia River Valley: always at the foot of the towering Cascades. You'll shoot exciting rapids, then relax while floating through the fertile orchard country side. The trip is typically sunny, with a bit of serenity and plenty of action. The Wenatchee River is a perfect trip for groups large and small, couples or an entire family and one that is certain to make you a whitewater advocate. We'll be meeting for the Wenatchee River trip at a NEW and easy-to-find location. Just head to Leavenworth and you will find us on the east end of Leavenworth (the Wenatchee side) on Hwy 2 just across the road from Mile Marker # 102. To get to Leavenworth take I-90 to the town of Cle Elum and take exit # 85 and follow signs to Hwy 970 and 97 North over Blewett Pass to Hwy 2. 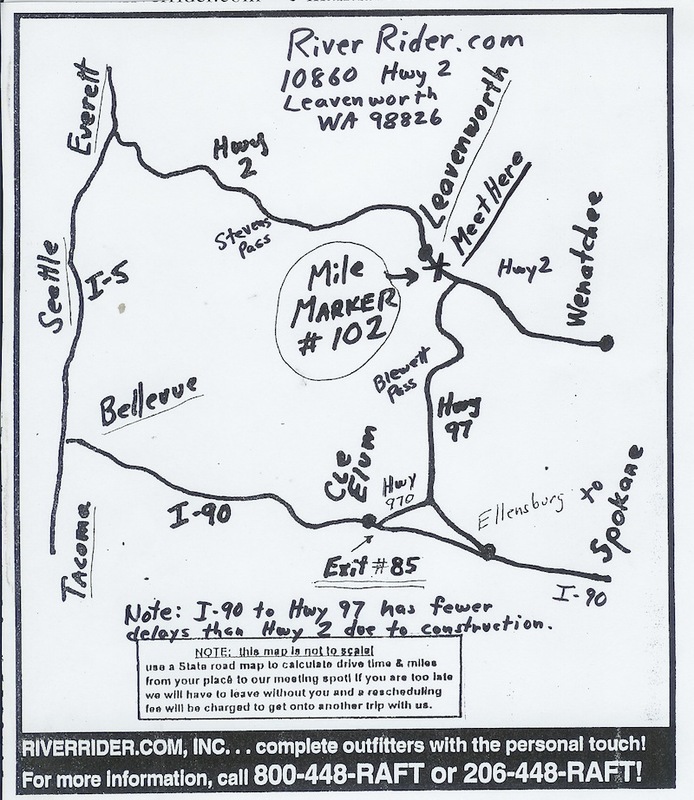 Go left on Hwy 2 and just as you reach Leavenworth you will see Mile Marker #102 and we are across the highway from it. Also, you can get to Leavenworth going east on Hwy 2 from I-5 in Everett and follow Hwy 2 to and through Leavenworth to Mile Marker #102and turn into the parking area.Use our detail map which is not to scale as well as a Washington State Road Atlas for planning and aiding your drive. We’ll have your wetsuit/booties waiting for you from our “rolling rental shop” (no presizing needed!) so just show up with a swimsuit or T-shirt/running shorts (something that can get wet) under your street clothes and we’ll take care of you from there when you get signed in. We also have a map with directions. We provide everything you could possibly want for lunch on the river whether carnivore or vegetarian. Our caterer prepares a scrumptious and varied array of food including BBQ’d meats, burgers, dogs or veggie burgers, fresh vegetables and dip, melons and fruits, breads, chips/salsa, and water or lemonade to drink. No alcohol is served. If you have special dietary needs just let us know and we'll be happy to try to accommodate you. The morning trip meets at 9am, goes rafting and finishes with the BBQ afterwards - and for the 1pm trip come hungry at 1pm for the BBQ then rafting later in the heat of the day. Take a look at the Wenatchee Lodging page for a list of hotels nearby.